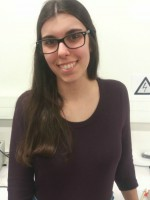 Born in 1995, Rute received a BSc in Chemistry from the University of Aveiro in 2016, during which she started working in the development of magnetic nanoparticles with Dr. Joana Barata and Prof. Tito Trindade. Later, she received a MSc in Biomedical Materials and Devices in 2018, while also working as a Research Grantee for a project of Dr. Nuno J. O. Silva (Cool Point) regarding the development of nanoparticles for biomedical applications. She is currently a Research Grantee of the same project.